Kiwifruit has shown tremendous potential in the recent years in Arunachal Pradesh and it has assumed huge popularity and preference among the growers as well as consumers due to its favourable properties for easy maintenance and marketing besides having high nutritional and medicinal values. The kiwifruit of the state has already attained commercial identity not only in the local markets but also in the national as well as international markets. The kiwifruit cultivation has an important advantage that it comes in the market during October to December when practically no other fruit is available to compete with it. Another major benefit of its cultivation is that the fruit is harvested hard and can be transplanted to long distances without using sophisticated packing material. Although there is a great potential for its cultivation in Arunachal Pradesh, yet its cultivation has not gained momentum because of poor transfer of cultivation technology to the farmers. Consequently, the kiwifruit produced in Arunachal Pradesh is of small and poor quality attributes and thus is not able to complete with the fruits imported from New Zealand, Australia, Italy and other countries. The biggest bottleneck in the production of kiwifruit in Arunachal Pradesh is the lack of awareness about its Improve Package of practices. Arunachal Pradesh is leading producer of Kiwifruit and has also priorities the fruit for more area expansion. Despite congenial climate and soil and improve package of practices are the major constraints in enhancing the productivity of kiwifruit. Kiwifruit was first catalogued in 1821 by Nathaniel Wallich in Nepal. Kiwi plant seeds were brought to New Zealand in the early 20th century, where it was eventually domesticated and sold worldwide. Currently, commercial growth of the fruit has spread so many countries including the India, United States, Italy, Chile, France, Greece and Japan. The Kiwi fruit is native to China and centre of origin is in the mountain ranges of South Western China where it occurs naturally as a deciduous fruiting vine. Kiwi fruit or Chinese gooseberry (Actinidia deliciosa) is known as “China’s miracle fruit and the Horticultural wonder of New Zealand”. Kiwi fruit though being introduced very lately in the year 2000, is gaining popularity in the mid- hill parts of Arunachal Pradesh. It is mostly grown in Arunachal Pradesh in some sizable area but other states like Sikkim, Nagaland, Meghalaya and hills of Manipur have vast potential for successful cultivation of Kiwi fruits. Kiwifruit belongs to family Actinidiaceae and genus Actinidia. The genus Actinidia has 76 species and about 125 known taxa worldwide, but among these only twospecies Actinidia deliciosa (fuzzy kiwifruit) and Actinidia chinensis (golden kiwifruit) have been produced commercially. Arunachal Pradesh is the largest state among the Northeastern states having an area of 83,743 Sq km with the population density just over 17 pop. /km2. Major portion of land of Arunachal Pradesh falls under mountains and hills with an elevation between 60 meters and 7300 meters. They largely come under the Himalayan and Patkai ranges of mountains. 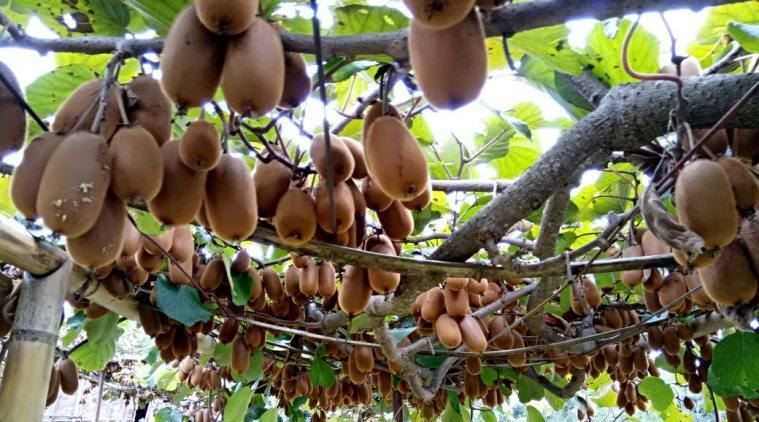 It has been experienced in the last few years that the farmers of Arunachal Pradesh are taking more interest in kiwifruit crops than other crops. India imports 75% of its domestic demand for fresh kiwis. Thus, there is huge scope to upscale kiwi production in north-eastern states in general and Arunachal Pradesh in particular. Yield of kiwifruit is low due to lack of package of cultivation practices and poor maintenance of orchards. Training and pruning of undesired branches during off-season are considered important agronomic practices for good yield. Kiwi vine normally grows 2-4 m every year and becomes overcrowded and unmanageable if not controlled through pruning. Similarly, thinning is also important to reduce number of fruits in a bunch so that fruits grow to a normal size. The cultivation of kiwi is limited to a few north-eastern states; it has not received any attention in agricultural research. Extension support remains poor because of scattered cultivation in difficult terrains. In this state most of the orchards have a mixture of varieties, and these when sold without grading fetch lower prices. This is because of non-availability of variety specific nurseries. Kiwi from Arunachal Pradesh is marketed for consumption as fresh fruit. There are only two wineries that too were established recently. But, their viability is a concern as kiwis are available only for 3-4 months, which is not sufficient to run both the wineries. Kiwifruit is rusty brown with hairy surface and looks like a sapota fruit. Flesh is light green in colour with decorative pattern of lighter coloured rays radiating from the centre and embedded in between are many small, soft and dark seed. Fruit has refreshing and delicate flavor, pleasing aroma and high nutritive and medicinal value, rich in vitamin-C and contains more potassium, phosphorus, iron and low in calories. The fruit is highly acclaimed for its nutritive and medicinal value. It is rich source of Vitamin C and E (twice that of orange and more than Guava, Tomato, and Avocado) and low in calories. It has more potassium than a banana or citrus fruits. Many studies have shown that it contains many medicinally useful compounds, which may be beneficial in the treatment of sleep disorders and the fruit has high nutritive and medicinal value. It is also rich in minerals like Phosphorus, Potassium and Calcium and has dietary fibre. The plant is a vigorous, deciduous climber that grows to about 9 meters in height, tolerating full sun or semi-shade. Kiwi plants were originally grown in mountainous, forested regions of China. It is a small fruit approximately 3 inches long and has a brown hairy peel with a green flesh and white pulp in the canter with many tiny black edible seeds. Kiwi is dioecious (male & female flower are born on different plant) thus needing plants of both sexes to produce fruit. The kiwifruit vine grows well between 900 to 1600 m above sea level wherever the climate is warm and humid. This fruit can be successfully grown in Jammu and Kashmir, Himachal Pradesh, Assam, Meghalaya, Nagaland, Mizoram and hills of Tripura. The plant will grow under moderate and high rainfall conditions. The strong wind and frost during growing periods are however injurious to the plants. A rainfall of about 150 cm is sufficient for kiwifruit growing. The summer temperature should not go beyond 350 otherwise the fruits are injured by sun burn. A deep friable sandy loam soil, well drained and supplied with irrigation is the best for growing kiwifruit vines. Steep land is contoured into terraces for planting vines. The rows are to be oriented in a north-south direction to avail maximum sunlight. Preparation of pits, mixture of farmyard manure and filling are to be completed by December. Most suitable method of multiplication is cuttings. The cuttings of 0.5 – 1cm thick with short internodes and 15-30cm long are ideal. Hard wood cutting are prepared during the dormant season (Dec- Feb) from the previous year summer growth. It should have at least 3 healthy bold buds from middle of the shoot. Semi hard wood cutting with 3 buds and 0.5 – 1cm thick from the middle portion of the current season growth are taken in July. The base of the cuttings are wounded and treated with 4000-5000 ppm IBA for 15 – 20 seconds and to prevent rotting the top portion are waxed. The cuttings are provided 2 nodes below and 1 or 2 nodes above the media. Kiwifruit has a bright prospect in Arunachal Pradesh. It has been assessed as one of the important future commercial fruits. It provides high return per unit area and the farmers can earn about Rs. 4 to 5 lakhs per hectare annually. Kiwifruit bears heavily every year with no crop failure. In kiwifruit, no serious pests and diseases attack have been observed, thus it has a better scope to become commercial eco-friendly fruit crop of the country. Due to hard nature of the fruit with hairy skin surface, the fruits are not damaged by any bird and even not by the monkeys. It has a longer shelf-life and can be stored for one month in open at room temperature and for 4-6 months in cold storage. It is strongly recommended that kiwifruit production be taken up in a large scale in Arunachal Pradesh. The kiwifruit could be developed into a vital industry for sustainable economy in hilly region. Kiwifruit has bright prospects in our country and has been assessed as one of the important future commercial fruit. Its cultivation in our country is of recent, and the total production and productivity is very low, yet there is tremendous scope for its cultivation. Anil Kumar Jena is assistant professor in Arunachal University of Studies, Namsai.